Its almost a month since Windows 7 beta experience program had been closed .Geeks and and Windows Vista users now have Windows 7 on their desktop .Or probably they have the opportunity .But still many people are using Windows XP as their default OS .Cause they don’t have enough RAM and other system resources that offer a smooth run for Windows 7 . Here comes the use of transformation packs those which can convert Windows XP’s appearance to Windows 7 . After the initial beta release of Windows 7 , many people started creating conversion packs for Windows XP . I found few working Windows XP to Windows 7 transformation packs and here I am sharing them. 1. WIndows XP to Windows 7 transformation pack . Windows XP to Windows 7 changes wallpaper, icons, bootscreen, Styles, Sounds, Login,Cursor and man other features of Windows XP desktop to Windows 7 . 2. Transform Windows XP icons and notifications to Windows 7 by patching user32.dll in Windows XP with that of Windows 7 . A deviantart user has extracted Windows 7 user32.dll and made available to the Windows XP users . He has also created an easy to use installer that can replace the files safely . Windows 7 user32.dll changes Icons , notifications and and UAC icon in windows XP . 3. Convert Windows XP to Windows 7 , without any transformation pack . 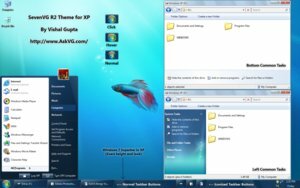 Vishal Gupta of askvg.com has a lot of tips and tricks on his site for the customization of Windows XP , Windows Vista and Windows 7 . Here I am giving a link to one of his post which explains few methods to convert Windows XP to Windows 7 ,without any transformation packs .He has also produced a theme style that exactly takes Windows XP to Windows 7 looks . Download AskVG refresh theme to transform Windows XP’s appearance that of Windows 7 . Took a old HD with a USB/sata cable and downloaded it to my new HP6210f which is windows 7 and the old HD is windows XP. Little problem now. how do I convert the old xp information that now on the new computer to windows 7.
this pack is really coll nd one can hardly recognise that weather it is windows xp or windows 7….